While Texan palettes enjoy lightly seared steaks with cool-purple centers, Ethiopian palettes prefer steaks purple all around. 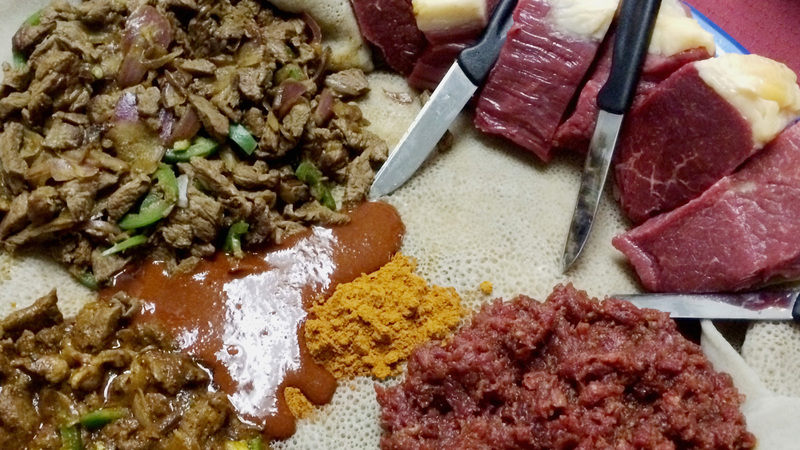 Known as tere siga or simply, “raw meat,” this Ethiopian delicacy started the same way as sweetened condensed milk. That is, as a wartime staple for soldiers on the front lines. For Ethiopia, success during the Battle of Adowa depended upon soldiers keeping their camping location secret, which consequently meant avoiding dinner-time smoke signals. This rediscovery of uncooked meat—and the acquired fondness for chewy bites of cold, raw, grass-fed beef—led to its elevation as a celebratory cuisine suitable for holidays, weddings and other excuses. For example, BK’s aunt recently stopped into town, and so we welcomed her by feasting at Abay Market in Northern Virginia. We shared a plate of cooked beef tibs, kurt (raw steak) and kitfo (raw minced beef). The challenge is that, in Texas, a gratious houseguest never refuses food that has been offered. In Ethiopia, a gratious host will offer food until the guest refuses. And by cultural design, the act of offering and refusing usually repeats itself about a dozen times before the host will accept defeat. On one occasion, before I knew of this culture-clash, I was fed a steak, two chicken breasts, and a steak-and-vegetable kabob before I placed my Texan manners aside and pleaded becca, or “enough.” That initiated the ceremonial exchange of a dozen more offers, some of which were succesful. Cousin Tizu later taught me to announce being full at the beginning of the meal, which I recommend.